AirFit F20's frame flexes naturally to fit each individual user's facial profile, minimizing facial contact, improving stability, and providing an unrestricted field of view. F20 doesn't require any facial contact above the eyes and integrated padding, within the frame, adds cushioning so you can read, watch TV and enjoy your bedtime routine without worrying about pinching, pressure or red marks from your mask. 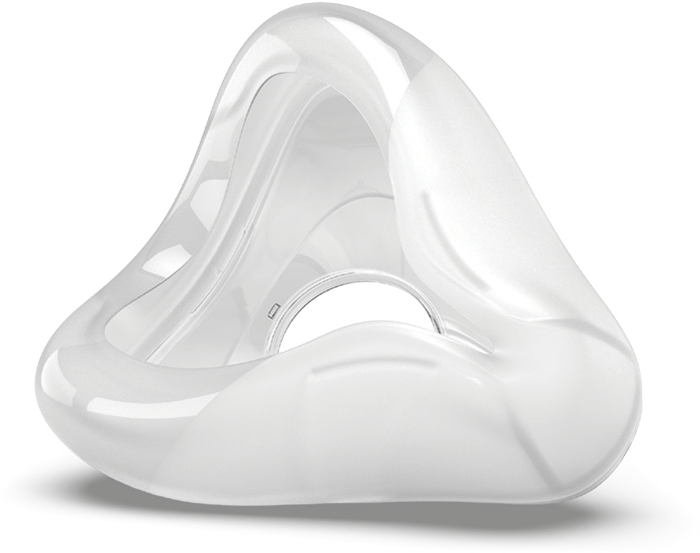 AirFit F20's ingenious full face cushion features "infinity" loops and variable thickness levels to help reduce blowout and provide support along the sides of the nose while relieving pressure at the nasal bridge. InfinitySeal's soft, frosted surfaces feel more natural on the skin and maintain a secure seal even at the highest sleep therapy pressure levels. Three cushion sizes are available -- Small, Medium and Large -- to fit a wide range of users. 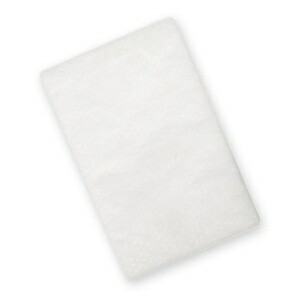 Plush Headgear, specifically designed for extra softness and stability, is included with all F20 masks. Rolled-edge fabric straps on the headgear are designed to be worn loosely so the InfinitySeal cushion can adapt to your individual facial contours without excessive pressure. Magnetic clips on the lower straps guide the headgear into the frame so it is quick and easy to put on and take off. All AirFit F20 masks come with Standard Headgear with blue highlights. 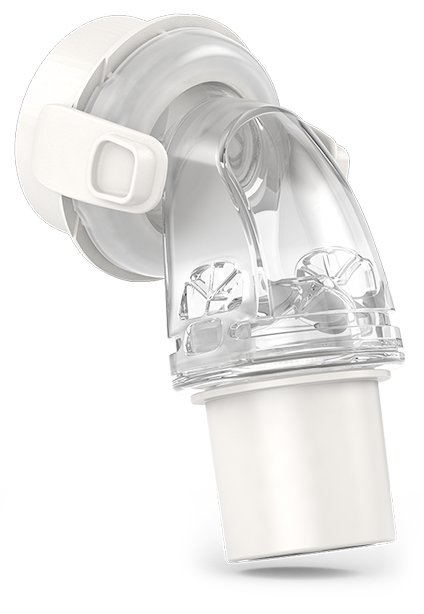 AirFit F20 features ResMed's QuietAir Elbow with almost silent air dispersion and a more gentle exhaust airflow than ever before so everyone can enjoy a quiet, comfortable night's sleep. F20's elbow also features quick release squeeze-tabs so it's easy to detach with one hand at night; and it rotates 360° with an independent tube swivel to reduce tubing drag and resistance. AirTouch F20 & AirFit F20 masks are built around the same flexible, padded frame and headgear system so all of the cushions and parts on both masks are completely interchangeable. Easy and convenient AirTouch F20 & AirFit F20 let you customize to suit your needs and sleep your way! After trying so many different companies and styles, I finally found the one which suits my comfort needs. I love the Head Gear for the AirFit F20, the Magnets are absolutely ingenious. The Cushion leaves a lot to be desired. The Silicone at the top and bottom of the Cushion is very thin and fragile. Mine developed a jagged tear at the top and my Husband repaired it with tape. I am due for another Cushion next month and am going with the AirTouch F20 instead. I had the F10 previously. The F20 is a great improvement in fit and comfort. But, in a period of 6 months, I had three F20 full face masks, and each one tore the cushion at the nose bridge. I am not pulling the straps tight, it is very comfortable to wear. But after three bad masks, I went back to the F10. This mask has many nice features. It is easy to pop the cushion in and out and I love the magnets on the lower straps. The upper straps were very short. Even with them in the loosest position the mask put terrible pressure on my nose. Therefore I would end up with a headache when I got up. Really wished this one had worked for me. I have paid out of pocket for over 2 years trying to find a mask that I could live with, and I finally did! Received yesterday and it was so simple to operate and find that fit that isn't pinching your face off, or giving you neck pain. I hated to take it off. My horrible allergies were better today, and my energy level was up. I am going to order another to keep on hand. This is also a good company to deal with! Compared to the F10: Harder to clean because the headband and face mount doesn't break down as easily. Slightly less comfortable on the face because the silicone material is thicker and stiffer. Though it sounds quieter to me, my partner insists it is louder. The magnet attached headband is a significant improvement for ease of putting on and also not over-stretching the sides bands, required when putting on/taking off the F10. Most significant to me is that the mask creates a superior and easy to achieve seal on the face compared to the F10. Though I've gotten the F10 to work fine for me, the F10 is not nearly as robust in maintaining its seal when sleeping on the side. I use a medium size with both the F10 and F20. Well made and works perfectly!! So far I am disappointed. My CPAP is sat at 20. I can not get this mask to stop leaking. According to the size gauge, I need a large. All of my other mask are medium. Headgear has very little stretch. I have never had headgear hurt the back of my neck the way this thing does. They claim it is quitter. 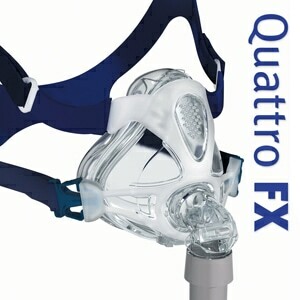 It is not quitter than my ResMed Quatro FX. I had high hopes. Waist of Money. 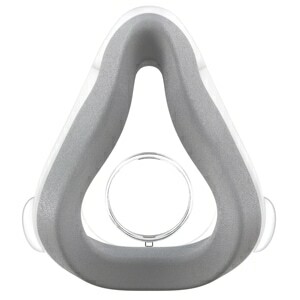 I think I've tried almost every mask and the AirFit F20 is the most comfortable yet. 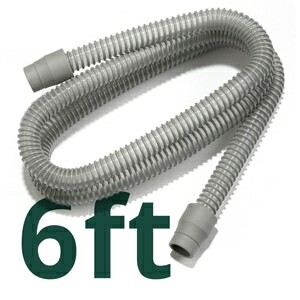 It's not necessary to tighten it to prevent air leaks. I use up to 22 cm of pressure. There's an air leak most nights of 5 L or less, but this mask doesn't make the farting sound as others do. It's a very quiet mask overall; almost silent. I don't get any skin irritation at the bridge of the nose. I think this may be the perfect mask for me.